Small Craft Advisory Press : "SCAP is a newly founded artists book press at Florida State University in Tallahassee, Florida. Our mission is to enable artists and scholars to create artists book editions that push the boundaries and traditions of the book arts." Tallahassee, Florida: Small Craft Advisory Press, 2016. Edition of 70. 4.5 x 5.5" case bound cloth over boards. Pink outline of Florida on front board. Letterpress printed. Fold outs. Pink end papers. Numbered. Small Craft Advisory Press: "A Guide to Florida, 2016 honors the original manuscript prepared for the Department of Public Instruction in 1939. Twelve writers and twelve artists have reinterpreted the text, filtering the culture of Florida from 1939 through their individual views of American culture in 2016." Colophon: "This book was made by twelve writers and twelve artists who were paired together through a lottery system, and assigned a chapter from the original 1934 manuscript. They were given a list of design constraints to use for their re-interpretation of the original text. Like a graphic design game, there were rules to follow: the only font that could be used was Perpetua 10, 12 or 14 point, and the only colors were Pantone 101 (yellow), Pantone 230 (magenta), Pantone 298 (blue) and black. Pairs were assigned a specific page structure with their essay. Some of the collaborators chose to break these rules." "Federal Writers' Project was a component of the WPA tasked with recording and writing as much about American life as possible. This group of over 6,000 writers collected recipes, songs, folklore, and slave narratives within their individual communities. Collectively, they wrote A Guide to the States, a series of 48 books, one for each state. Chapters in Florida: A Guide to the Southernmost State were written anonymously by Florida writers like Zora Neal Hurston and Carita Doggett Corse. The text describes a place of so many cultures and ecosystems that a singular identity for Florida would be difficult to describe. "After they finished Florida: A Guide to the Southernmost State, the writers were asked by the Florida State Department of Public Instruction to prepare a book of essays about the ecology and history of Florida for school children. This manuscript was never formally published. It was placed on the shelves at the Florida State Archives in a library binding, type-written on thin sheets of onion skin. "I found this manuscript. ... The essays create a delightful summary of Florida's culture: full of plants, ocean water, stars, and local legends. The diversity of Florida is both acknowledged and celebrated. "A Guide to Florida, 2016 honors the original manuscript. ... Twelve writers and twelve artists have reinterpreted the text, filtering the culture of Florida from 1939 through their individual views of American culture in 2016." Participants: Keith Kopka and AB Gorham, Mary Jane Ryals and Denise Bookwalter, Jessie King and Allison Milham, Deborah Hall and Landon Perkins, Ron Salutsky and Abigail Lucien, Jay Snodgrass and Ellen Knudson, Jessica Plante and Jessica Peterson, Michael Trammel and Scott Bell, Kristine Snodgrass and Bridget Elmer, Danilo John Thomas and Michelle Ray, Christine Poreba and Kevin Curry, Jeff Peters and Sonja Rossow. Tallahassee, Florida: Small Craft Advisory Press, 2016. Edition of 35. 7 x 10'; 24 pages including covers + one loose leaf laid in with colophon. Letterpress printed. Laser cutting. French folded pages bound in a handmade paper wrapper. Laid in four-flap paper portfolio. Numbered. Small Craft Advisory Press: "A collaboration between Macy Chadwick, Denise Bookwalter, AB Gorham, and Sara White. Flashpoint is an assemblage of four distinct elemental forms: the mind’s internal workings, a river’s digressions, the rhythms of sleep, and the sprawling patterns of fire. These disparate elements converse with one another, intertwine, overlap, and rupture the surface of the folded, translucent folios, creating complex hidden interiors. Each collaborator investigated her chosen pattern, creating patterned imagery and text that, when printed onto the page, culminates in a din of voices and visual moiré. Only then does the initial discordance of singular patterns give way to textures more complex, nearly harmonious." Macy Chadwick: "Flashpoint explores the patterns inherent in thought, riverbeds, wildfires, and sleep. Each French-folded page presents echoes of brightly colored imagery printed on the verso of the pages, and an intricate layout of text on the recto. Four distinct artists' voices and images emerge and come together to create order out of chaos." Tallahassee, Florida: Small Craft Advisory Press, 2015. Edition of 75. Box with pamphlet and two parachutes. 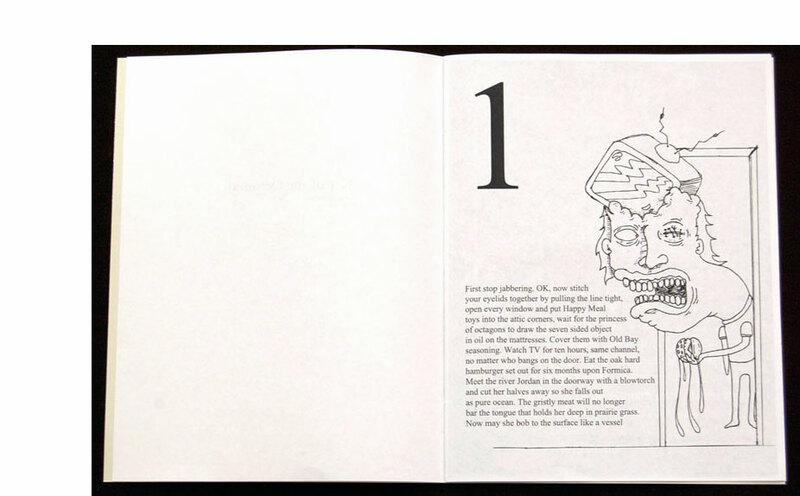 Pamphlet: 6 x 9.5", 12 pages; 24 x 10.25" foldout; letterpress printed; pamphlet stitch bound in paper wrappers; numbered. Parachutes: two 5.25 x 4.75" folded; pocket enclosure (one blue with white design, one white with blue design). In an edition of 75 with 55 regular and 20 deluxe. Regular edition in 6.5 x 9.5" archival gray box with reinforce metal brackets on the corners. 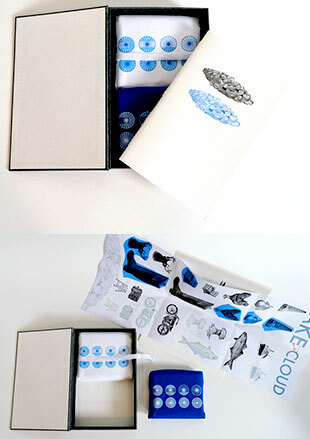 Deluxe edition in 6.4 x 10" cloth covered box with three dimensional cloud and water images added to lid exterior. The parachutes are metaphors for the transformative process of reading. Cover anything with the blue parachute and turn it into a lake, or use the white parachute to make it a cloud. A sort of book artist's version of Eliot's objective correlative? Prospectus: "Lake + Cloud explores the expansive experience of reading by transforming the reader's physical space into a landscape containing a lake and a cloud." 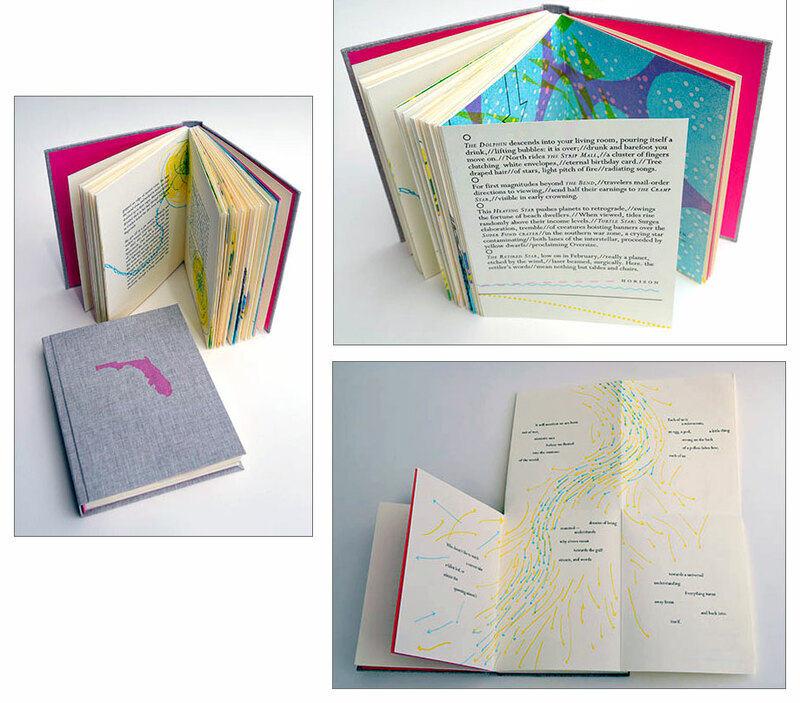 Small Craft Advisory Press: "Lake + Cloud is a collaborative artists' book project between Katie Baldwin and Denise Bookwalter. In contrast to other projects underway at SCAP, the artists worked together for a month at Vermont Studio Center during a residency to plan their collaborative work. While they were planning Lake & Cloud they also worked on parallel series of individual works that investigated the original idea of Lake & Cloud. This artist book uses a pair of parachutes and an operation manual to transform space. 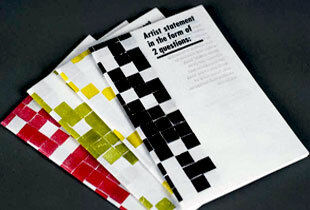 In manipulating the object, the viewer is engaged in the process of 'reading' the book. 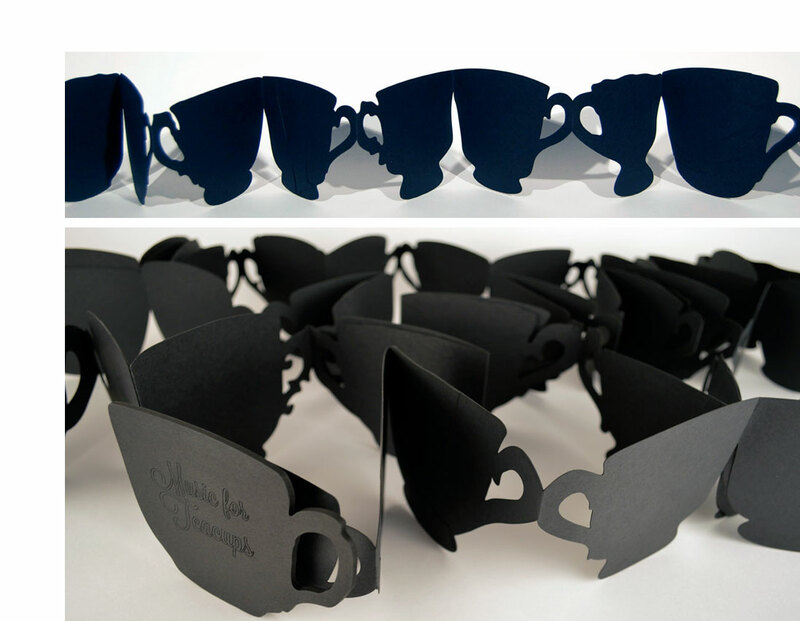 The project illustrates the poetic and organic collaborative process from inception to object." 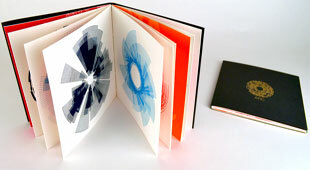 Katie Baldwin teaches book arts and printmaking at the University of Alabama in Huntsville. She was at Wells College from 2011 – 2013 as the Victor Hammer Fellow. She is a graduate of The University of the Arts in Philadelphia, Pennsylvania. Denise Bookwalter is the Director of the Small Craft Advisory Press at Florida State University in Tallahassee. She is an assistant professor art and head of printmaking for FSU. She has an MFA in printmaking from Indiana University, Bloomington, IN, an MA in art education from the University of Illinois, Bloomington, IN, and a BA in geological sciences and art theory and practice from Northwestern University, Evanston, IL. Tallahassee, Florida: Small Craft Advisory Press, 2015. Edition of 200. 6.5 x 6.5" four-flap cardboard box with colophon pastedown on interior base. 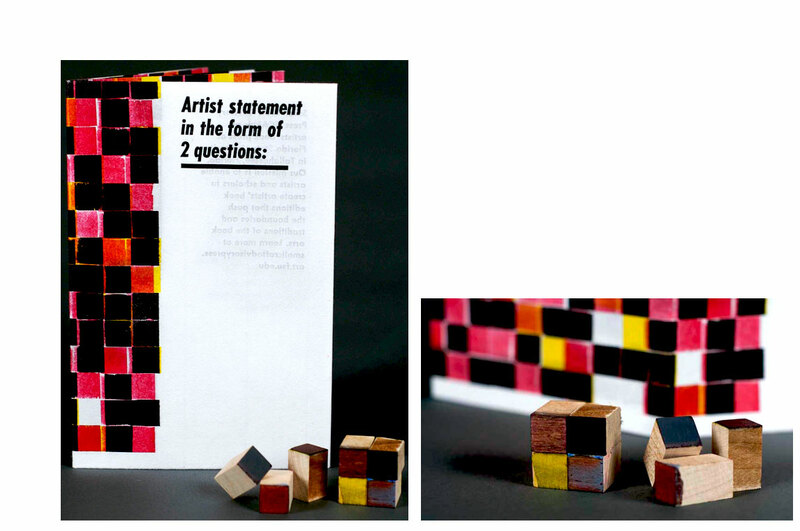 Contains 12 double-sided 3 x 3" blocks, each bearing a letterpress printed image. Magnet inserts on each side. 1" wide yellow rubber band closure. Numbered on colophon. Small Craft Advisory Press: "This modular piece features a collection of 12 letterpress prints adhered to magnetic blocks. 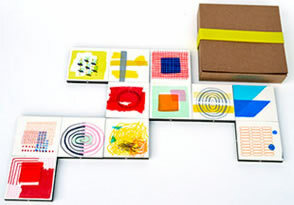 The blocks are housed in a custom made four-flap cardboard box with accompanying pastedown." VVVVV relates to Judy Rushin's participatory painting project Variance Invariance, in which Rushin created a system so that artworks could be assembled, dismantled, and shipped in small boxes. Using 12 modules that can be attached, unattached, and reattached by a series of small embedded magnets, VVVVV allows the viewer/participant to rearrange the images/prints to form new artworks. By employing viewer interaction, VVVVV advances the notion and the reality of participatory art. Tallahassee, Florida: Small Craft Advisory Press, 2012. Edition of 50. 4.25" x 4" x 2" box containing three round 'books.' 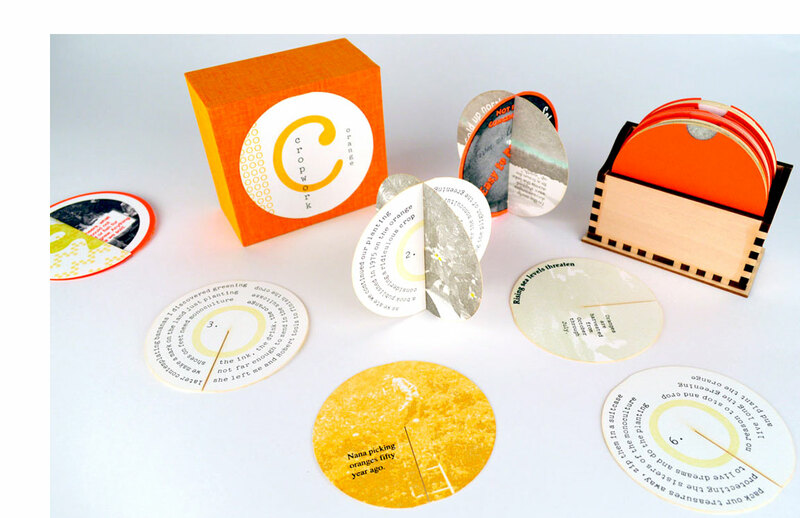 Each book 12 round pages (3.5" diameter) that slip into rounded orange paper slipcase. Text and image letterpress printed on Rives BFK. Box lid cloth-covered with printed label. Wooden-box base with three slots for books. 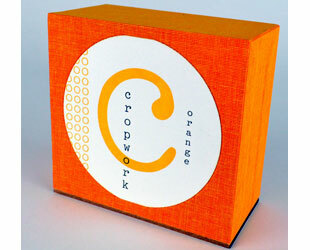 Small Craft Advisory Press: "Cropwork Orange is a collaboration between three artist/educators with roots in Florida. Robert was Bea's teacher and Bea was Denise's teacher. The project combines memory and transfer of information with its modular pieces that come together to make individual oranges out of the memories and thoughts of the three artists. All three sets of 'oranges' are housed in laser cut envelopes that slip into a custom-made laser cut wooden box." Tallahassee, Florida: Small Craft Advisory Press, 2012. Edition of 30. 9.5 x 9.5"; 18 pages. Accordion structure. Screen print and letterpress. Boards bound in screen printed cloth. Numbered on colophon. 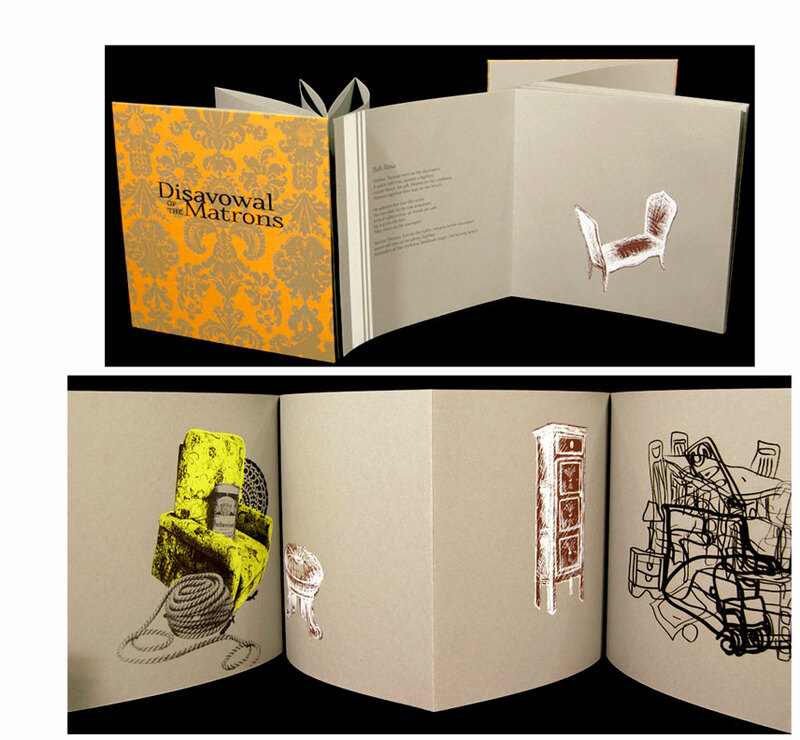 Small Craft Advisory Press: "This collaborative book was produced in a graduate printmaking class at Florida State University, taught by Denise Bookwalter. Under the direction of SCAP resident poet, Jay Snodgrass, students worked in pairs to write and illustrate a spread in the book. Students in the Hybrid Print class were, Hans Rasch, Adam Williams, Allison Milham, Samantha Burns, Craig Ryan, Melinda Swift, Peter Kamback, Courtney Thayer and Heidi Dawson." Colophon: "Poet Jay Snodgrass ... worked with students to teach them about writing poetry, and students in turn, shared their own individual creative processes with Jay. The students then paired off, each group writing a poem and creating the accompanying imagery. The lay out and design of the book were all collaboratively decided upon and executed." 8.5 x 11"; 10 pages. Photocopied pages with letterpress printed covers. Pamphlet stitch bound. 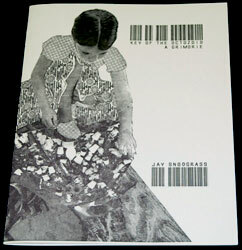 Jay Snodgrass is the Resident Poet at Small Craft Advisory Press and the author of two books of poetry. A grimoire is a book of magic, typically a book of instructions for spells, amulets, or talismen. 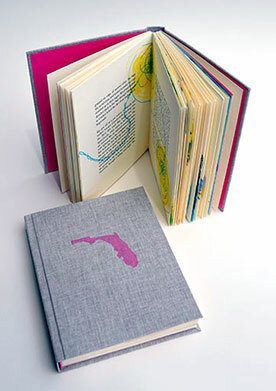 Small Craft Advisory Press: "This collaborative book was produced in an advanced printmaking class at Florida State University, taught by Denise Bookwalter. Students worked with SCAP resident poet, Jay Snodgrass, and created illustrations for his poem using various printing techniques and collage work. Students were Jorge Becerra, Kaitlin Derespino, Michelle Lafrance, Emma Massaglia, Austin Phelps, Dan Schmahl, Elisabeth Sclawy-Adelma and Brian Starke." 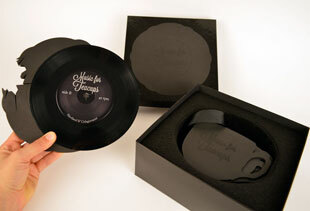 8 x 8 x 3" felt-lined lidded box containing book and record. 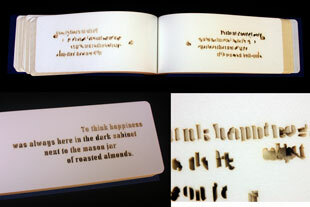 Book (5 x 4.5"; 48 leaves plus boards): accordion of black French paper with lasercut shaped pages and laser-engraved text. Book extends to 25 feet. Record: 45 rpm in heavy stock slipcase. Shaped paper title on lid. Numbered on colophon. Small Craft Advisory Press: "Haviland and Colagiovanni visited SCAP for three weeks in the springtime of 2012. Their collaborative project Music for Teacups is an extension of their previous collaborations with fine china and sound. 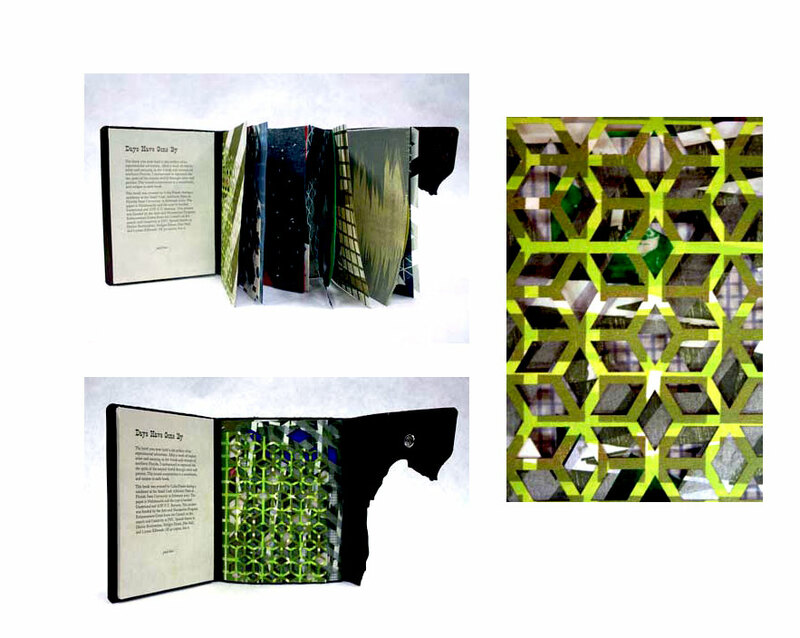 The artists' book is a laser cut accordion book measuring 25 feet when open. Included with the book is a 7-inch vinyl record that the artists have composed from the sounds of breaking teacups." The project was made possible by funding from the Arts and Humanities Program Enhancement Grant from the Council on Research and Creativity at Florida State University in Tallahassee, Florida; Baker and Ohio University Research Council Grants from Ohio University in Athens, Ohio; and support from the RENCI Center in Chapel Hill, North Carolina. The included EP was mastered at Thread Audio in Raleigh, North Carolina. Tallahassee, Florida: Small Craft Advisory Press, 2011. Edition of 50. 7 x 7.5 x .25"; 18 pages. Images printed from laser cut wood blocks on SCAP's Takach Etching Press on Arches 88. Cover was laser engraved with formLab's [formLab is Florida State University's center for arts research] Epilog laser cutter on Steel Gray Dur-o-tone French cover stock. Numbered. Small Craft Advisory Press: "In this book, artist Marius Watz explores the translation of his digital and code based imagery from the screen to ink on paper." www.mariuswatz.com: "Marius Watz is an artist and educator working with visual abstraction through generative software processes. His work is concerned with the synthesis of form as the product of parametric behaviors. He is known for his hard-edged geometries and vivid colors, with output ranging from software works and public projections to physical objects produced through digital fabrication technology." Tallahassee, Florida: Small Craft Advisory Press, 2010. Edition of 60. 7.25 x 9 x 1.5"; 26 pages. Single sheet letterpress pages printed on SCAP's Vandercook Universal 1. Photographs on Kodak Portra film scanned for digital imaging and layout. Printed on Crane Lettra paper. Bound in three-ring binder with laser engraved details. Laser cut and engraved paper sculptural object in pocket of first page. Signed and numbered by the artists. Small Craft Advisory Press: "Binder is a reflection on the evolution of the paper family photo archive. Artists Kris Merloa and Tate Shaw created a virtual family photo archive and framed it within a fictional scholarly tome complete with fictional works cited page and printed page turns. 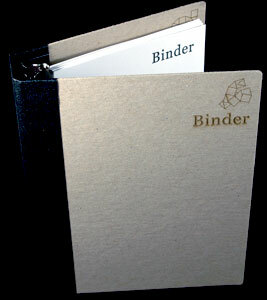 The pages are contained within a binder with the possibility of reordering. The family pictured in the images are people in the artist's close circle of friends. The binder family references groups within communities of people that move away from their birthplaces and create familial like connections and relationships based on work, location, vocation, and geographical proximity." Collaboration as Impetus, CBAA 2011 session abstract: "In 2010 Merola and Shaw were invited to create an edition for the new experimental artists’ residency and publishing program at Florida State University’s Small Craft Advisory Press and FormLab. Binder is a 24-page book letterpress printed from photopolymer plates and includes a pocket to hold an irregular, 2-D polyhedra that was laser-etched and cut and can be folded and transitioned by the reader for the creation of geometric, 3-D forms. 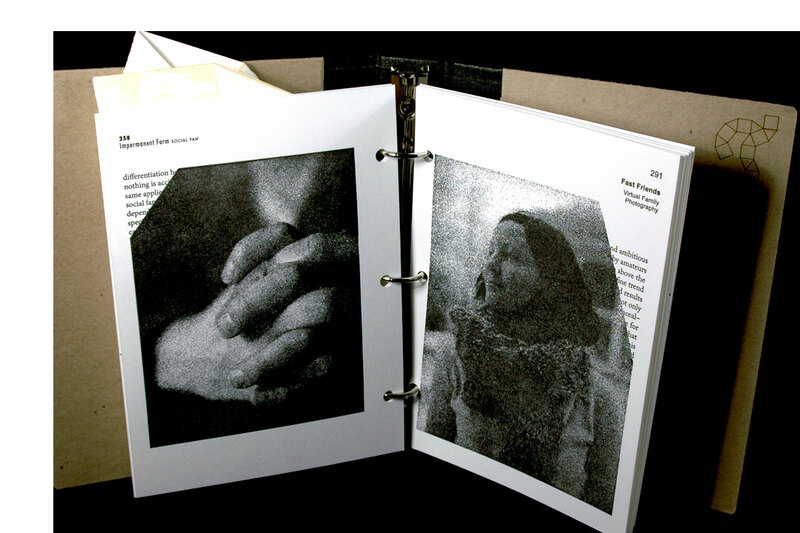 Binder is a 3-ring binder and artificial study manual about an invented theory of Virtual Families. Merola, a photographer whose previous projects conceptualized family photographs, turned her camera on a group of friends that are family placeholders. As with many family albums, the photographer is mostly absent from the book’s images, created in both 2004 and 2010. In past projects Merola’s work has shown that current trends toward digital storage of family archives are an unsettled matter in contrast to Shaw’s work, which accepts and reflects the mass shift toward digitization in our culture. Shaw and Merola saw SCAP’s letterpress and digitally driven FormLab as an opportunity to collaborate and respond to their own divergent thinking about the image in a digital era. Merola’s photographs were made on film, scanned, and then merged with Shaw’s digital book layout. Each page was output back to film for photopolymer plate production. The same images were used as faces of the digitally designed 2-D object prepared for laser etching and cutting. Shaw’s recent projects making 3-D photo sculptures that represent the flexibility of contemporary digital image storage, paired with Merola’s photographs, brought about a concept that is the Virtual Family. For Shaw and Merola’s, Binder, a Virtual Family is a group that gathers and functions as a family unit while maintaining flexible boundaries and without a hierarchical structure. Likewise the pages of their 3-ring binder book have a flexible sequence and boundary (they can be added to or subtracted from). The same is true for the 2-D polyhedra object included, which can be permutated infinitely without ever forming a geometric Platonic solid." Tallahassee, Florida: Small Craft Advisory Press, 2010. Edition of 40. 5.75 x 7.5"; 38 pages. 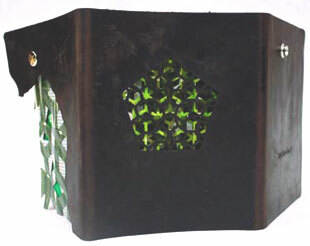 Leather covered book with snap closure. Inside pages are two pamphlet stitched sections pasted facing each other, allowing pages from each section to interleave in any order. 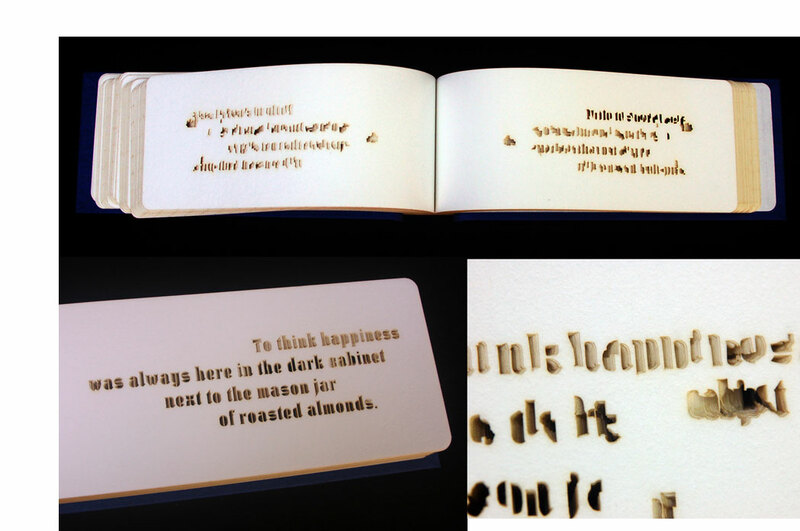 The book was made with laser cut wood blocks on SCAP's Vandercook Universal 1 letterpress. The pages where then subsequently laser cut and bound. The cover was also laser cut. Each book comes with a unique sound composition on soundtrack, housed on the inside of the front cover. Signed by the artist. Small Craft Advisory Press: "Colin Frazer spent a month in the gulf coast of Florida. He traveled along the coast for a week collecting photos of the landscape, flora, and fauna. He then returned to Small Craft Advisory Press at Florida State University, where he translated the images into geometric patterns, cut blocks, printed pages, and layered the pages to form the complexity of the Florida gulf coast landscape interpreted in pattern and paper." Colin Frazer, Introduction: "The book you now hold is the artifact of an experimental adventure. After a week of exploration and camping in the woods and swamps of northern Florida, I endeavored to represent the spirit of the natural world through color and pattern. The sound composition is a soundtrack, and unique to each book." Tallahassee, Florida: Small Craft Advisory Press, 2010. Edition of 50. 12 x 4 x 2"; 155 pages. Letterpress and laser cut pages. Printed on SCAP's Universal 1 Vandercook letterpress. Laser cut on an Epilog Zing laser cutter. Letter transformation using Rhino, a 3D modeling program. Printed with Ogaki and Myriad fonts on Japanese Hosho Paper. Cloth covered cover with brass post binding. Small Craft Advisory Press: "Spandrel is a collaborative project between artist Denise Bookwalter and poet Frank Giampietro. Giampietro applied the term spandrel to his left over bits of poetry elevating them from discarded lines to a form of poetry. The term spandrel is an architectural g\term for the space between a curve and a rectangular boundary like the space above an arch or below a stairway. It is a space that is necessary to create something else. The spandrel becomes as important as the thing that it is surrounding. "In the book two poetic spandrels are cut into the pages. The first appears in full at the beginning and the other in full at the end. Through 150 pages the letters of the first poem on the first page transform into the letters of the last poems on the last page. In the middle of the book the letters become unreadable. By cutting and removing the letters from the book, the book becomes the spandrel itself. If the letters were not removed from the book the book would be blank pages. The book becomes a spandrel." Tallahassee, Florida: Small Craft Advisory Press, 2010. Edition of 93. 5 x 7.5" folded, 8 pages; 20 x 15" extended. One sheet book. Text and images were letterpress printed from Larned's modular font and polymer plates on Japanese paper. Signed and numbered. Small Craft Advisory Press: "During her residency at SCAP, Emily Larned created an experimental, modular font for letterpress, which she donated to the press as a resource for others to use and continue to experiment with. 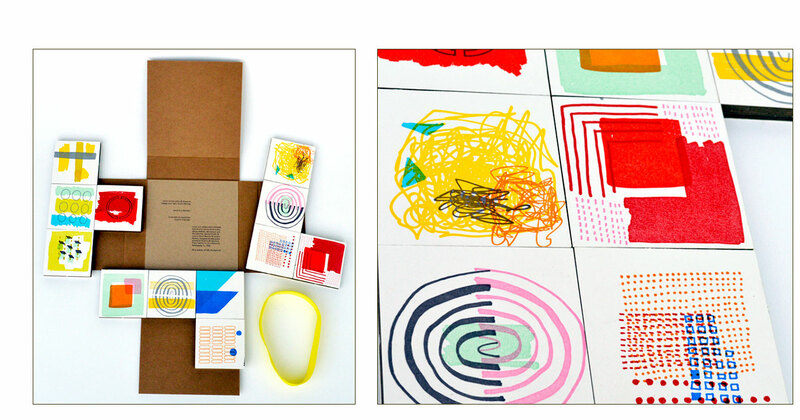 She has also published a print-on-demand, process book that documents her project." 1. How can we create a new reusable printing resource for letterpress? 2. How can a finished project serve as a starting point for others?" Tallahassee, Florida: Small Craft Advisory Press, 2013. Edition of 30. 9.25 x 13.75 x 3.5" closed, 9.25 x 28.75 x 3.25" open; 6 folded pages. Letterpress. Laser cut. Laser engraved. Materials: paper, felt, ripstop nylon, silky solid polyester, knit, rabbit fur, birch plywood. Numbered on the colophon. 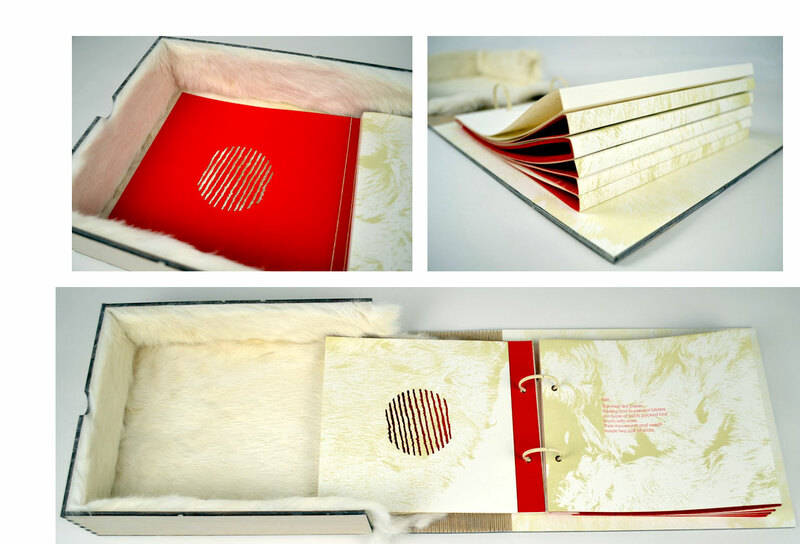 The book is made of an engraved birch plywood enclosure with a living hinge lined with rabbit fur. 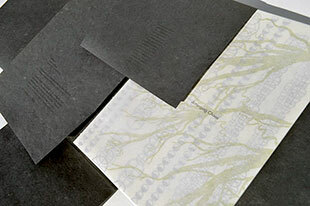 Letterpress printed pages are backed with felt, ripstop nylon, satin, silky solid polyester, and knit jersey. Pages are laser cut with interpretations of fabric as seen under the microscope. 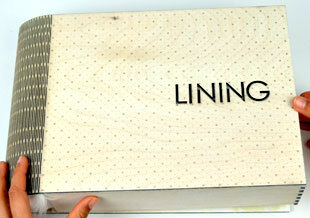 Cover with laser engraved pattern, living hinge spine, laser cut title with rabbit skin backing and rabbit fur. Tray lined with rabbit fur. All five pages plus title page closed and stacked. The red fabrics inside are each of the five lining fabrics waiting to be read and unfolded. Small Craft Advisory Press: "Lining is about the fabric in clothing that goes next to the skin. Many garments are lined with specific fabrics chosen for their softness, pattern or warmth. Lining represents five of these fabrics within its pages. Each of the five fabrics is mounted on a page that folds out revealing it as a lining of that page. Cut into the pages are microscopic images of each of the fabrics and a poem accompanies the lining fabric with a poetic description of the textiles. The book itself is lined with actual rabbit fur and prints of rabbit, also a material used for lining gloves and other warm clothing. "The conversation about this collaboration began last spring near the east shore of Lake Michigan at Oxbow during the Paper Book Intensive. Lee Emma Running and Denise Bookwalter were both instructors and participants for the first time. They taught each other and learned they worked well together and shared a common interest in pattern, texture, and textiles. A long distance conversation continued over the year and culminated in a one-week spring residency at Small Craft Advisory Press part of the Facility for Arts Research at Florida State University. "The book is made of an engraved birch plywood enclosure with a living hinge lined with rabbit fur. 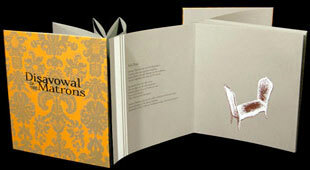 Letterpress printed pages are backed with felt, ripstop nylon, satin, silky solid polyester, and knit jersey. Pages are laser cut with interpretations of fabric as seen under the microscope."